The history of Aurangabad dates back to 1610, when Murtaza Nizam Shah of Ahmadnagar instructed his Prime Minister Malik Amber, to build Fatehnagar, as a sort of resting place on the site of a village called Kharki. In 1653, when Mughal Emperor Shah Jahan appointed Prince Aurangzeb ‘Viceroy of the Deccan’ for the second time, Aurangzeb decided to make Fatehnagar his capital and renamed it ‘Aurangabad’. Thereafter, Aurangabad has steadily grown into one of Maharashtra’s major cities—steeped in history and heritage, it offers some of the most beautiful and unique places of tourist interest in India. For most visitors, a visit to Aurangabad begins with the world heritage sites of the Ajanta Caves. The drive to Ajanta takes at least two hours, and it is best to leave early, as the caves can only be visited between 9 a.m. and 5 p.m. There is also a Tourist Lodge at the base of the hills, run by the Maharashtra Tourism Development Corporation offering meals and comfortable accommodation. The time just after the monsoons is undoubtedly the best time of the year for visiting Aganta, when rains turn the entire region green, and the temperature drops by at least ten degrees. The rocks are cool, and the experience of walking through these caves is simply magical. The 29 caves at Ajanta lie in a semi circle on a scarp 250 ft. above the Waghora River, which had flowed through this once isolated ravine. Lying hidden from the world for centuries, these caves were discovered quite by chance by a British soldier about 180 years ago. Built between 2nd century BC and 650 AD, they correspond to different periods in history. Caves 8,9,10,12 and 13, pertain to the Hinayana period in the 2nd and 1st century BC. The rest of the caves belong to the more recent Mahayana group - caves 6,7and 11 date back to 450-500 AD, 14 to 20 belong between 500-550 AD, while caves 1 to 5 and 21 to 29 were completed between 550-650 AD. In the caves at Ajanta, hewn out of natural rock are some of the most unique images of the Buddha, including a huge image of a reclining Buddha. But more important perhaps, than the Buddha images, are the spectacular frescoes on the walls, listed among the most important Buddhist wall-paintings in the world. The process of cutting into the basalt, carving, and painting must have been long drawn out, and several decades were undoubtedly spent on each cave, to achieve these splendid frescoes. Over the years these frescoes have slowly faded but we can but marvel at the beauty of these unique creations. To ensure that future generations have the good fortune of seeing the paintings, images of all the frescoes have been stored on CDs, and can be accessed on computers near the site. 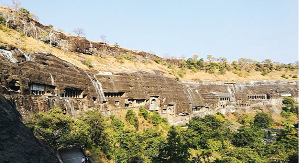 After a pleasant lunch at the Tourist Lodge, and back in Aurangabad, then next site to visit are the Aurangabad caves that lie within the city and can be reached by a steep flight of rock-hewn steps. Located on a hill running east to west, these 12 caves are all of Buddhist origin, and dug out of comparatively soft basalt rock during the 6th and 7th century. The carvings at the Aurangabad Caves are notable for including Hinayana style stupas, Mahayana art work and the Vajrayana goddess. These caves are also among those in India that include first millennium Buddhist artworks with gods and goddesses such as Durga and Ganesha as well as Buddhist deities of the Tantra tradition. For those keen on history, there is another spot that deserves a visit. This is the Panchakki (also called Nehar-e-Panchakki), that was used to grind wheat for royal armies and also to feed pilgrims, who visited the tomb of Baba Shah Muzaffar —a Sufi Saint and spiritual adviser to Aurangzeb. Here, there is a grinding wheel rotated by water, traveling through an underground channel from a source, 8 km away in the mountains. The water-mill is kept fed with sufficient water by an underground conduit, which commences from a well just above the junction of the Harsul river with a tributary stream eight kilometers away. After crossing the tributary stream near its confluence with Harsul, this water-pipe is connected to the Panchakki reservoir, arranged in such a way that the water falls into the Panchakki cistern from a sufficient height to generate the necessary force to drive the mill. Also worth seeing is the Masjid which dates back to 17th century and a huge 300 year old tree that stands near the tank. Also in the city is Emperor Aurangzeb's wife's tomb, the Bibi ka Maqbara and in keeping with his dislike of ostentation, the Maqbara is much plainer than what one would have expected. However, one must add that though it pales in comparison with the Taj Mahal, it is on the whole a pleasing and very popular monument with a well laid out garden. There is also a museum on the premises with some of Aurangzeb’s items of daily use— offering an insight into the austere lifestyle of an Emperor, who had ruled the largest area of India during the Mughal Era.